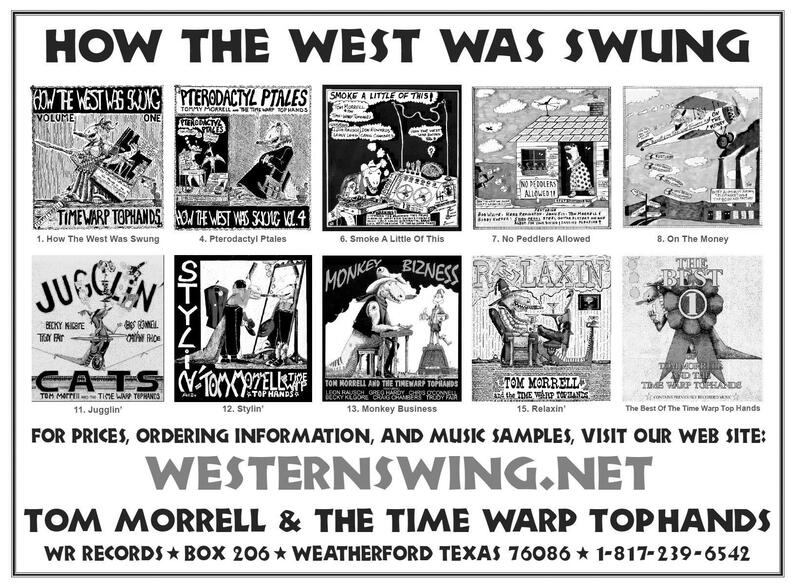 The Northwest Western Swing Music Society holds showcases on the second Sunday of every month . Contact Beryl Shawley at 425-374-2452, bshawleyl@comcast.net or write NWSMS c/o 12433 Admiralty Way, S – 201 Everett, WA. The Sacramento Western Swing Society meets the first Sunday of every month from 1– 6pm at the VFW Hall, 2784 Stockton Blvd., Sacramento, CA. Call 916-487-0760 for more information. Asleep at the Wheel - 9-time Grammy Award winningl Texas-based western swing band. The Time Jumpers - Nashville studio players, the Time Jumpers has evolved from casual jam sessions at the Grand Ole Opry to performing on the main stage, and becoming THE Monday night destination in Nashville. The Western Swing Authority - A group of some of Canada's top touring and session musicians who share a common love of Western Swing. 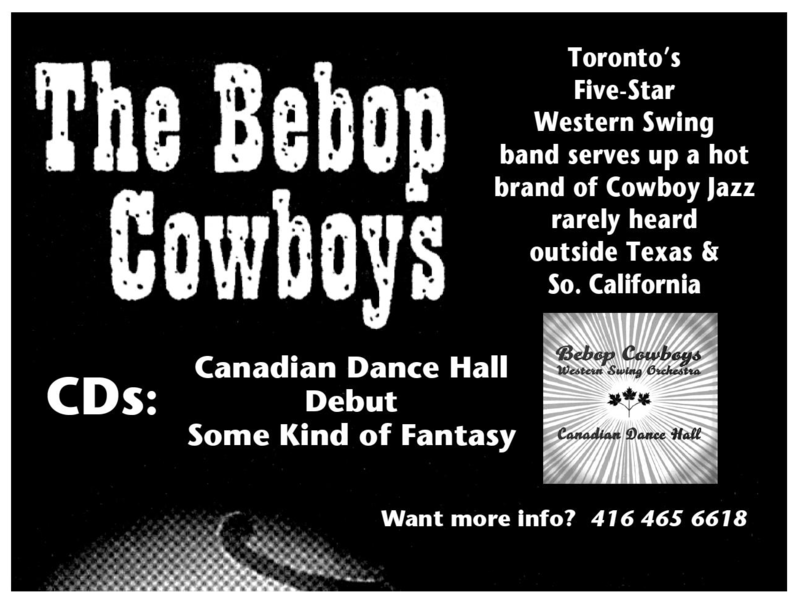 Bebop Cowboys Swing-a-Billy Orchestra - The self-declared best Western Swing band in Canada. Respected performers from the Canadian music elite led by jazz/country guitarist & band leader Steve Briggs. 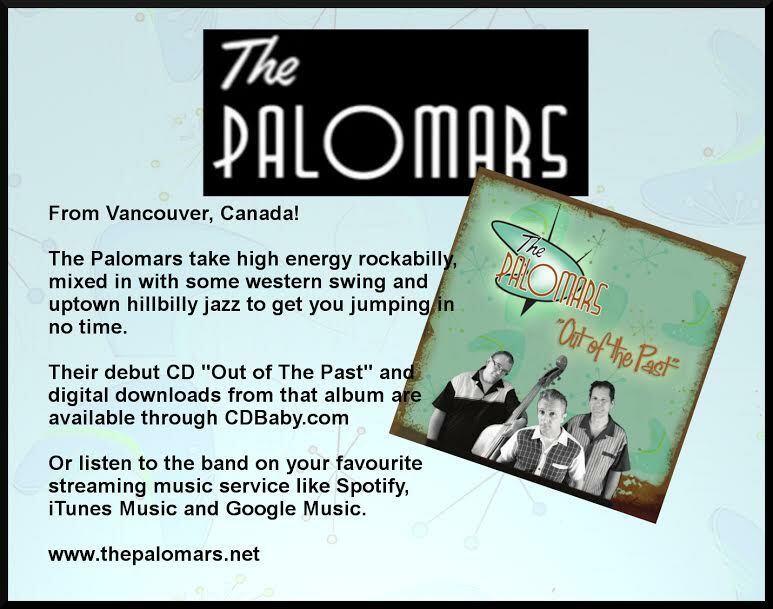 From Vancouver, Canada, The Palomars take high energy rockabilly, mixed in with some western swing and uptown hillbilly jazz to get you jumping in no time. Check out their debut album "Out of The Past".